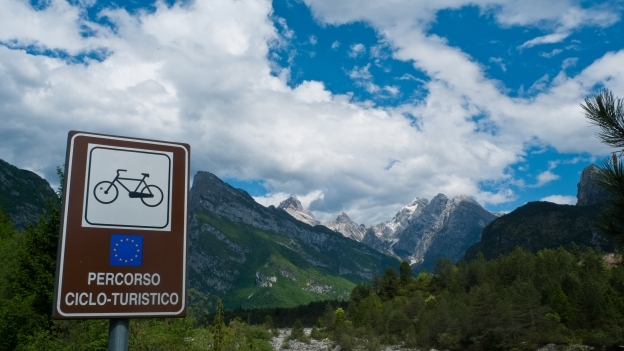 Italy has lots of great cycleways, and lots of websites with inform­ation about them. However, most of this inform­ation is on regional or local sites, and there are very few national sites. bicitalia If you're inter­ested in the network of national long-distance routes then this is the site to head for. The aim of the site is to provide online maps of the network of cycleways, together with inform­ation about places to stay and points of interest. The bicitalia network includes 17 national routes. The site and network is still a work in progress - but new inform­ation is being added all the time. (Note: the pages can be slow to load - stick with it). For the many local and regional routes not included in the bicitalia network, the most useful site covering the whole of Italy is piste-ciclabili.coma site that provides user-uploaded routes and roadbooks. There's no English version but a handy Google Translate button. Despite the title ('cycle paths') the site has lots of on-road routes as well. It's probably most useful for people looking for routes in a particular area, as opposed to long-distance travellers, but it's by a long way the most compre­hensive national resource. Most tourist inform­ation sites are run by the regions and province (the equivalent of UK counties). But there are a few national sites that are well worth visiting. italia.it is the new site for the Italy tourist promotion authority. The new site is a dramatic improvement on the old. A good site to browse for ideas and places of interest. There's also a handy listing of the many smart­phone apps produced by local and regional tourist bodies (not all of them, it has to be said, are much use). UNESCO World Heritage Sites: Italy has more UNESCO world heritage sites than any other country. There are a few places that I think should be on the list but aren't, but if you want an overview of the must-see places in Italy this is the site to visit. Borghi Belli d'Italia: Italy's most beautiful villages - or at least some of them. (While the home and some other pages have been trans­lated into English most of the pages about individual villages are in italian - but Google Translate does an OK job). Not every beautiful village joins this associ­ation so don't assume that it's exhaustive, but it's a good guide to attractive places that often don't make it into the guide­books. parks.it: Italy has 24 national parks and 146 Regional Parks (not to mention nature reserves etc etc). This is an excellent site which gives loads of inform­ation about the parks, places to stay, places to eat. As well as enabling you to search by region, and on a map you can also do thematic searches - eg all of the parks and reserves in the Apennines or the Po delta or all of the parks and lakes). Most parks have their own websites, and these are well worth checking, but if you want to know about Italy's wild and unspoilt places then this is defin­itely the place to start. FIAB Albergobici: a directory of bike-friendly accom­mod­ation put together by the Italian Friends of the Bike (FIAB). I've never come across a hotel or B&B that was bike-unfriendly, but some of the more bike-friendly hotels might be able to provide tools and a place to do maintenance and repairs if you need to. Booking.com: this is my favourite site for booking and researching hotels. It's not compre­hensive and but there's a very wide selection. One of the most useful features is the customer review and rating system. If you use a smart­phone they have an extremely easy to use app. TripAdvisor.it: has pretty good coverage in Italy and it is being increas­ingly used by Italians. Well worth checking for hotel and restaurant recom­mend­a­tions - but of course don’t assume that all of the reviews are genuine. There are two sites for researching and booking hostels in Italy. There's aighostels.it, the website of the AIG (Association Italiana Alberghi per la Gioventù) . There's also the Hostels International - hihostels.com. Hostels International has on online map and you can also download a pdf guide to hostels in Italy, the AIG has a snappy search engine. Both offer online booking services although I've never used these. Bear in mind that there are lots of independent hostels, and hostels and rifugi run by national parks may not appear in these listings sites. Most hostels now seem to use Booking.com. eurocampings.eu is a website operated by the Dutch ACSI organ­isation (available in several languages). A pretty compre­hensive listing of campsites - although bear in mind that there are good sites that aren't listed in the guide. The listings of facil­ities are detailed and well-organised, with a useful customer review and rating system. Most of the customer reviews are in German or Dutch but the numerical scores are a pretty good guide - 8 or more is a very good site, 7 is average and below 7 OK for a night if you don’t have a better option. There’s also a mobile site and smart­phone app. alanrogers.com: UK-based rival to ACSI. A useful site although it doesn't include as many sites as ACSI and doesn’t offer customer reviews, so sometimes you have to read between the lines of the inspector’s report. There are the most sites for travelling by train to, and within Italy. seat61.com provides useful advice on general inform­ation on travelling by train in Europe. bahn.com (also bahn.co.uk and bahn.it. Provides a timetable search engine that enables you to search for trains with bike carriage facil­ities. This works for journeys within Italy as well. You can also book tickets over the site for journeys on DB trains to and within Italy, but note that you can't book bike spaces - you have to ring their call centre. They also do a very useful smart­phone app. I haven't been able to find inform­ation in English about the DeutscheBahn-ÖBB eurocity services to Italy from/​to München and Innsbruck. There's inform­ation in Italian on bahn.de and in German and Italian on the ÖBB website obb-italia.com. trenitalia.com. As well as looking up times you can also use the site to buy tickets - with your ticket sent (or texted) to you as a number that you give to the train guard. Unfortunately you can't (so far as I know) buy bike tickets online) so this is probably most useful if you are travelling without your bike (or with your bike in a bag).